I picked up this "not intended to be a meme" from Bobbi Newman at Librarian by Day. These are all books that made a difference for me, that changed how I looked at the world, and have added to my appreciation of it. 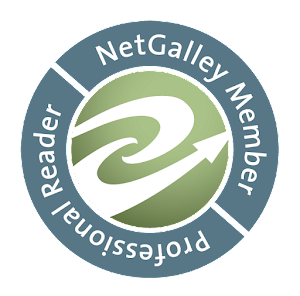 I hope you'll find something new and enjoyable to read here, and leave comments about your own favorites. Black Beauty, by Anna Sewell. This wonderful book about the life of a horse in 19th century England was my first introduction to the idea of truly getting inside the animal's viewpoint. I must have read other books earlier that had "talking animals," but they didn't have the same impact. Five Children and It, by E. Nesbit. Five children find a Sand Fairy, and get one wish granted every day. They have incredible, delightful adventures, but also learn that getting exactly what you asked for can be more trouble than it's worth! When I was a shy child whose family moved frequently, this book was an enormous comfort to me. I can't imagine that there could be a child in the world whose life wouldn't be enriched by it. We don't need to be this inefficient. We are the greatest nation on Earth; we can do better for our people. Also for our businesses, for whom these costs are a huge drain that their competitors in other countries don't have to bear. This is a highly readable account of the science of our nearest and most important star, and the stories behind how we have learned all that we know about it. Berman starts with such basics as how we tracked the Sun's movement through our sky and how it governs our agricultural year, to figuring out that it was Earth, not the Sun, that moved, to the latest very startling and disquieting observations of changes in the Sun and how those changes affect us. Or even understand the question when you call to ask, until you have explained it five or six times. The cooling centers have been open for a few days. The warnings are getting stronger and stronger--and on Thursday and Friday, the temperature will be hovering around 100, and the dewpoint around 80%. These are severely unhealthy conditions for humans, and not really any better for pets. But if there's a municipal cooling center that thinks that's any concern of theirs, I haven't found it yet. Definitely not in either Boston or Lawrence, though. Mass211 doesn't know of any, and doesn't think it's their job to have that information, either. I called the MSPCA--they're concerned with animal welfare, right?--and they thought it was "a great question," but had nothing to suggest except that I call around. Gee, thanks. 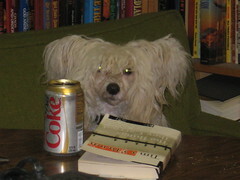 Brody stayed loyally by the side of a previous owner, an older gentleman, when the man died, until they were found. He came into Westie rescue, and was adopted out to a couple. They subequently adopted a three-year-old Scottie, and when the two dogs did not get along, they decided to surrender the older dog--Brody. 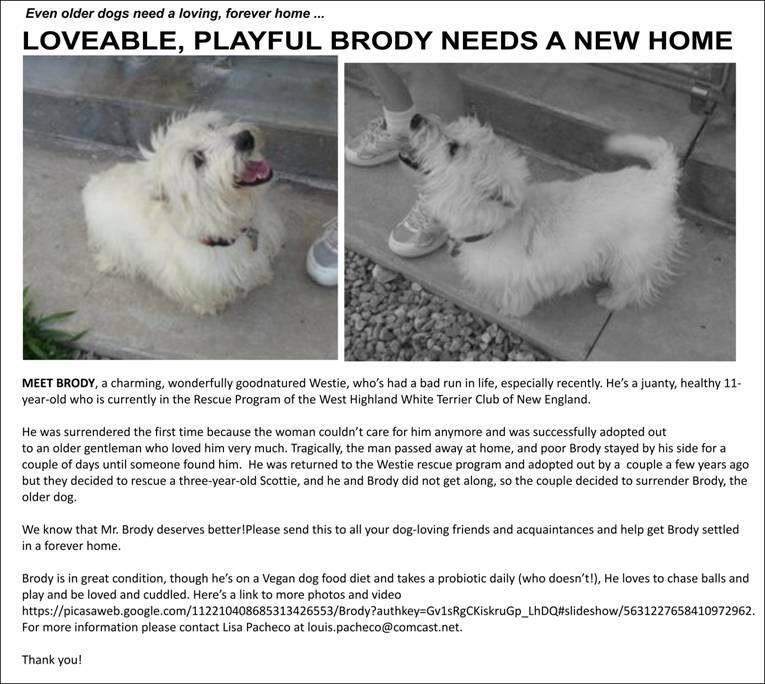 Brody is a healthy, friendly, wonderful dog, and he deserves better. He's in the care of the Rescue Program of the West Highland White Terrier Club of New England, but he's staying in a kennel and finding it stressful. Take a look at his pictures and videos, and contact Lisa Pacheco atlouis.pacheco@comcast.net for more information. Not sure about adopting a rescue dog? Take a look at The Adopted Dog Bible from Petfinder, or Second-Hand Dog by Carol Lea Benjamin for information, resources, and guidance. This is our latest visit with the ladies of the No. 1 Ladies' Detective Agency and their family and friends. After many months, epic bride price negotiations with Grace's greedy uncle, and the trauma of Phuti's loss of a foot in a previous book, Grace Makutsi and Phuti Radiphuti are at last making the final preparations for their wedding day. And Grace is starting to realize how her life will change, when she is married to this man whom she loves and who loves her--and who is wealthy enough that money will never again be a reason not to do something they really want to do. The great advances in medicine over the last century have been to a large degree advances in the creation of new and more effective drugs to combat diseases that were previously untreatable. Stockwell tells the story of these advances, how they were achieved, and why--a fact not widely recognized by the general public--the rate of new drug discovery has slowed dramatically, raising the spectre in the medical and pharmaceutical industries of an end to new drugs. In mid-March 2007, American pet owners heard the alarming news that several popular brands of cat food were apparently contaminated, and causing acute kidney failure in cats. Then the frightening reports began to include dogs, and then more and more brands, flavors, and types of dog and cat food. Fear, frustration, and anger spread as the FDA held press conferences every Friday afternoon assuring the public that the pet foods remaining on the shelves were safe and wholesome, and Friday evenings after the close of the news cycle, new recalls were announced.